Did you shop on Black Friday? If you did, and you bought things for people other than yourself, you’re most likely going to have to wrap those things. So you’ll need gift wrap, and then you’ll need to figure out a way to store the stuff. 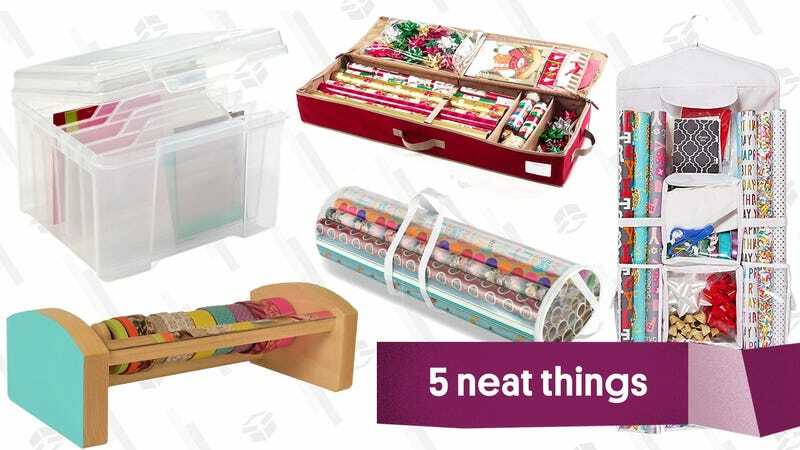 Here are some storage options that can help to keep your gift wrap collection under, um, wraps. This is like a suitcase for your wrapping paper — it’s also the right style for people who want to store gift wrap in an under-bed space, or on a narrow shelf. There are three size options (36", 42" or 52") and the organizer is outfitted with clear pockets to hold gift bags, bows and tags, and dividers for stashing spools of ribbon. It’s also made of water-resistant polyester, so storing it in a damp attic or basement won’t be a problem. You know those hanging shoe bags with the clear compartments? This is like that, but for gift wrap. The two-sided design has one big pocket that can hold 12 rolls of wrapping paper, and the other side is fitted with smaller pouches to hold ribbons and bows, tissue paper, and gift tags. 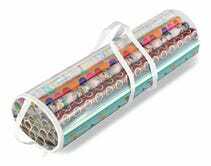 If you’re looking for a gift wrap organizer but don’t want to spend a bunch of money that could otherwise go towards the buying of presents, this Whitmor dealie is what you want. It only costs about 4 bucks! (Keep it in mind if you need to add a few dollars to an order total to get you to free shipping.) 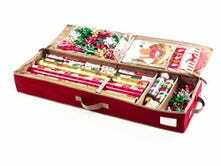 It can fit under a bed, or stand upright in a storage closet, and it can hold upto 25 rolls of wrapping paper. After you’ve wrapped the presents, you’ll of course want to jazz them up with ribbons and suchlike. This organizer, which is natural wood and can be painted or stained the color of your choice, can hold up to 65 spools of ribbon, and is designed without a central bar so that you can add and remove spools without having to take all the others off first.